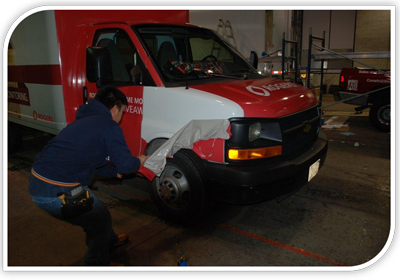 Our in-house state-of-the-art production team has the ability to print large format full colour graphics at incredible speed and resolution to help minimize the down time on your vehicles. two 54 inch SOLJET ProII for large format digital imaging Roll to Roll / Piezo Ink-Jet – 900 DPI (dot per inch) – 350 sq. ft. Per hour. Wide Gamut of colors, high resolution print, prints up to 50’ long, horizontal panels, easy installation. 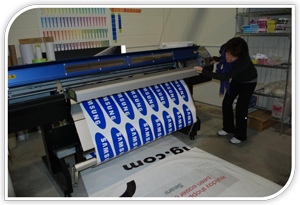 Our in-house large format vinyl cutting technology allows us to quickly cut and install a wide variety of stickers...nothing is too small. A large selection of vinyl colours is kept on hand giving our customers a fast turn-around and maximum selection. Vinyl cut letters offers a cost efficient solution for any graphics requirements. The key to maximizing the visual impact of a full wrap graphic package is to first create an effective graphic design using colours, logo and text. A keen understanding of the use of perforated vinyl over any windows of the vehicle is vital to designing on a vehicle. 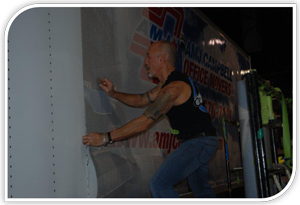 We are able to offer our customers a yearly evaluation of their fleet graphics to identify which vehicles require graphics replacements or repairs. This report will show the status of each unit and our recommendation and cost to maintain the type of clean and professional image so vital to a successful marketing plan. 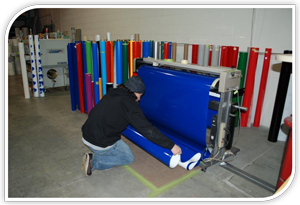 PRODUCTS: Southwood Graphics offers a wide range of products to meet your signage needs as well. Signs, banners, static cling posters, floor graphics, directional and safety signs, awnings, car signs, vehicle wraps, channel lettering and custom lit sign boxes are just some of the other products we offer along with signs, lettering, car advertising, advertising design, vehicle images, car images, your business logo on your vehicle, design graphics, full colour graphics, vinyl lettering, vinyl graphics, cost efficient solution for any graphics requirements, trailer graphic installations, certified graphic removers, full wrap graphic package, fleet graphics, graphics related products, graphic solutions provider, vehicle decals...and more! 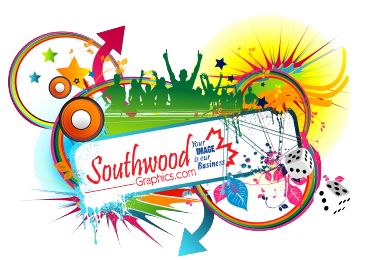 GRAPHIC DESIGN SERVICES: Southwood Graphics’ in-house graphic design team uses the latest software to assist our clients through each step of the graphic design process until they are completely satisfied with the image portrayed of their company. We strive to provide a dynamic and professional company image regardless of the vehicle type or colour and are able to adjust your image to work on any vehicle or surface your require. Our graphic design team is personable and easily available to offer suggestions on how to realize your vision through correct colour, logo and text combinations. We also check existing artwork files provided by outside designers to ensure your graphics are correct and before we go to print. Southwood Graphics believes customer consultation is key to the design process - it’s a chance for our customer to go over what they expect and for our graphic design team to advise them on what needs to be done to achieve their goals.